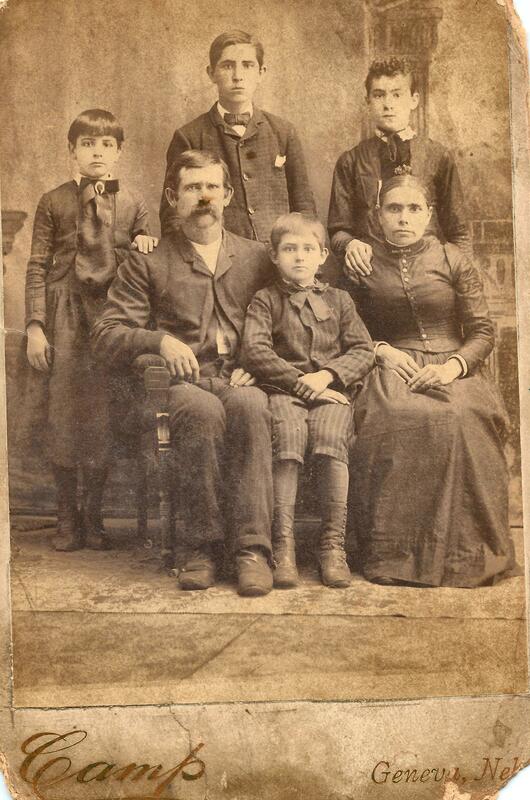 This is a family portrait (circa 1891, taken in Geneva, Nebraska) of my 2nd-great grandfather, George Franklin Pierce Wilson and his family. Back row (left to right) Dollie Elizabeth Wilson, age 12, Charles Issac Wilson, 16, Clara Etta Wilson (my great-grandmother), 15. Seated in front (left to right) George Franklin Pierce Wilson, 38, Clarence Cornelius Wilson, 11, Nancy Minerva Lightbody Wilson, 38. Love this family pic. I have never seen it before. Clarence Cornelius Wilson, the 11 year old, is my grandfather. Thank you so much for making it public. Clarence was my grandfather also. I have (and I think Gloria has too) a picture of this family when they are all older. Thank you for this picture. Thank you, Gloria and Paulette! I am so glad to see you both here…I have discovered several new cousins since starting this blog! I definitely would love to see any pictures you might have and I will be in touch with you both soon!